Honestly, I’m a little bit against individual awards for a team sport, but it means we’ve been the team of the month, so this is both for the staff and the players. We complement each other really well. The hours and hours that Kieran and Michael spend on planning the sessions, doing the sessions, working with individuals. We're a good group. We bounce off each other. Opinions are being thrown about in that office and in the end, I'm the “lucky one” that has to make a decision on who to leave out or to play. We want to be winning games. We want to move up the table and this is the start of it. Manchester United have already shown their power under Ole Gunnar Solskjaer as they are now the favourites to finish the season among the top four teams in the Premier League. We have already noticed that Ole Gunnar Solskjaer has set a new gameplan for Manchester United with a high-line of defence and three midfielders always there to support three forwards. United have some tough games in front of them. The prize could act as a power booster for the full squad. 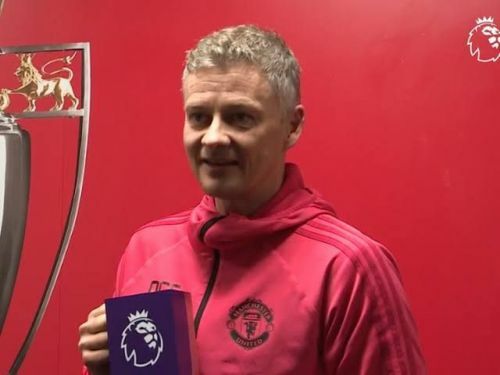 Solskjaer has been selected for this prize because his team won the first five games before drawing a home game against Burnley. Solskjaer could be appointed as the next permanent United's manager. Here are a few Tweets as Ole has won the manager of the month for January 2019 award. Ole Gunnar Solksjaer has been named Manager of the Month as Man Utd boss more times (1) than David Moyes, Louis van Gaal and José Mourinho combined (0). Official: Ole Gunnar Solskjaer is the Premier League Manager of the Month for January.